Using NASA’s Kepler Space Telescope, a team of astronomers has identified a regular pattern in the orbits of the planets in the TRAPPIST-1 system. This confirms the suspected details about the orbit of its outermost and least understood planet, TRAPPIST-1h. TRAPPIST-1 is only eight percent the mass of our sun, making it a cooler and less luminous star. It’s home to seven Earth-size planets, three of which orbit in their star’s habitable zone—the range of distances from a star where liquid water could pool on the surface of a rocky planet. The system is located about 40 light-years away in the constellation of Aquarius and is estimated to be between 3 billion and 8 billion years old. The animation shows a simulation of the planets of TRAPPIST-1 orbiting for 90 Earth-days. After 15 Earth-days, the animation focuses only on the outer three planets: TRAPPIST-1f, TRAPPIST-1g, TRAPPIST-1h. The motion freezes each time two adjacent planets pass each other; an arrow appears pointing to the location of the third planet. This complex but predictable pattern, called an orbital resonance, occurs when planets exert a regular, periodic gravitational tug on each other as they orbit their star. 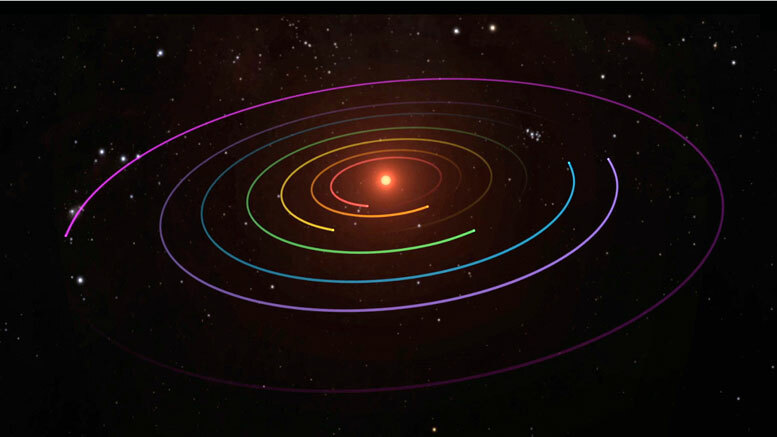 The three-body resonance of the outer three planets causes the planets to repeat the same relative positions, and expecting such a resonance was used to predict the orbital period of TRAPPIST-1h. The Kepler spacecraft stared at the patch of sky home to the TRAPPIST-1 system from December 15, 2016 to March 4 collecting data on the star’s minuscule changes in brightness due to transiting planets as part of its second mission, K2. On March 8, the raw, uncalibrated data was released to the scientific community to begin follow-up studies. Be the first to comment on "Astronomers Identify a Regular Pattern in the Orbits TRAPPIST-1 Planets"